The team going through a bonding session after the last training. Courtesy photo. 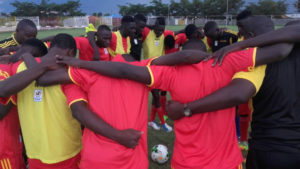 FOOTBALL–The Uganda U20 side, The Hippos, will kick-start their COSAFA U20 campaign today against 10-time record and defending champions Zambia at the Arthur Davies stadium in Kitwe, Zambia. The Hippos have a chance to revenge for thier 2015 U17 AFCON qualifiers loss to the Young Chipololpolo Boys who eliminated them over two legs but will equally be playing for a strong start in group A so as to better their chances of progressing to the knock out stage. Uganda is one of two sides that are competing as guests in the tournament with Egypt who will compete in group B being the other nation that was invited. Speaking after the last trainning session, U20 head coach Matia Lule highlighted the importance of getting all three points against Zambia today. “We are playing the record champions, the hosts and the defending champions so that should give you the motivation as a players and coach to want to win the game,” said Matia Lule. “Luckily for us, the players are in good shape and have been training superbly and when you see the level of focus of each and everyone, you just have to acknowledge the fact that they are all ready. The fact that Zambia beat us in the U17 a couple of years ago and that some of these players are were part of this game, it also serves as an extra motivation to want to beat them,” he added. “Am just hopeful that the boys can put up a good show and may be we can walk away with all three points come the sound of the final whistle. The Hippos were yesterday graced by the presence of former Cranes skipper Timothy Batabaire who commended FUFA on the fact that the young stars are now getting tournaments in which they can feature. “I would like to thank FUFA for their efforts in terms of trying to develop these players from a young age. Said the former SC Villa, Bloemfontein Celtics and Bidvest Wits defender,” Batabaire said. “We didn’t get the chance but luckily for these boys, the have got the chance of coming up through the ranks so as to reach the senior team which is a huge boost in anyone’s career. All i pray is that the coaches can work together to ensure that at least most of the reach the desired heights,” he added. The other group A game between Malawi and Swaziland will also be played today before the Cranes game. The Cranes starting team against Zambia today.